It's an unusual way of cutting hair with fire. The technique is being used for years now. It has become quite popular in several countries. Times are changing fast and the world is evolving at a new pace now, sometimes it seems so unreal and hard to catch up with. We don't want to fall behind, thus, try our best to get along with it. This is one of the many reasons that most of us are living with I-can't-imagine-my-life-without-internet Syndrome (Yes! I sort of made that up) caused by the Internet. We have been in love with Internet ever since it came into existence but we are addicted to it now more than ever. Internet is where something new, something weird, something funny or anything keeps taking the world by storm. We belong to the times where we have seen it all; from a man freefalling from space, people (even the powerful ones) taking up the so called challenges like " Mannequin Challenge" , "Ice bucket challenge" to 'what colour is this dress' and undoubtedly there will be many more to come. There are literally so many unbelievable things that are taking place in the world over every other day and your social media timeline is a proof of it. Isn't it? Recently, I stumbled upon a story on my Facebook timeline about a Palestinian barber who styles his customer's hair by using fire. But for some reason I didn't bother to read the story so scrolled past that news in search of something interesting to read on. Few days after that I came across a similar story. The story did not intrigue me this time either. 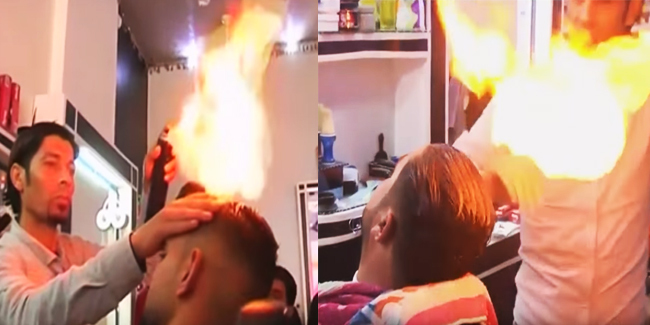 Just when I thought the Internet is done with 'hair on fire' trend, I came across another similar story about this unusual way of styling hair, but this time I couldn't help but read because it was a barber from a neighbouring country, i.e. Pakistan, who has been making headlines in the 'mailonline'. So, it got me thinking how this trend came so fast to Asia. And setting someone's head on fire to give them a haircut, is it for real? Surprisingly, it is. Here is what I gathered and what you should know about this new hair trend which involves use of 'fire'. 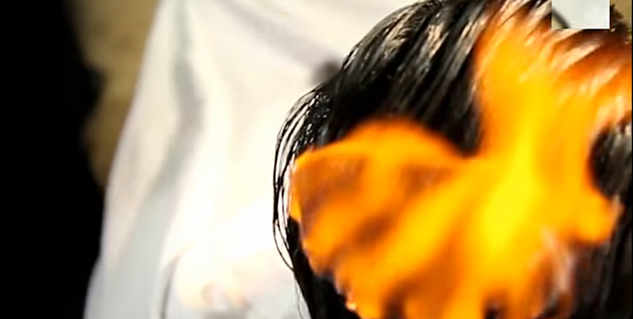 This unusual way of cutting hair involves pouring a flammable powder and liquid on customer's hair and bringing a burning lighter to their locks, which promptly catch alight. While the customer's head is still on fire, the barber then takes 2 combs to cut and style the hair into shape, as the flames continue to burn. Once the flames burn out, the barber continues with the haircut. He then combs through his customer's hair and shakes some more powder onto his head and once again sets the customer's hair on fire. On the other hand, some barbers use candles for styling their customers' hair. They light up a flock of hair only by the edges so as to burn off some part of each hair strand from the flock. It sounds super cool and gives your barber freedom to ditch the pair of scissors. So when are you going for the fiery haircut?